Predicting the result of the Oscars can be a tricky business. Especially as the Academy's membership, which votes for the awards, is changing year by year. The Hollywood remake of a remake of a remake, A Star Is Born looks likely to grab the most nominations, with The Favourite, Roma and maybe First Man not far behind. However, the film with the most nominations isn't automatically the favourite to win best film. In recent years, Gravity, The Revenant and La La Land have topped the list but then gone on to lose best picture. If, as seems inevitable, Roma gets a best picture nomination, it will be the first Netflix film to be up for best film. With much of Hollywood split over whether the streaming service represents a huge threat or a huge boost to the future of cinema, in awards terms this reflects the ability of the streaming service and its huge financial coffers to attract some of the cinema's best film makers. It would be a big surprise if there weren't British performers in all four acting categories. Christian Bale and Olivia Colman are considered dead certs in the leading categories, as is Richard E Grant for supporting actor. While either Rachel Weisz or Claire Foy, or perhaps both, should land supporting actress nominations. 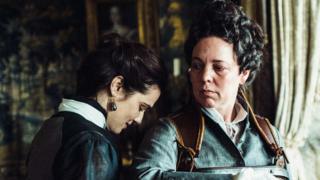 As is customary, a wide array of UK talent should be evident behind the camera, ranging from Jim Beach and Graham King who produced Bohemian Rhapsody to Deborah Davis and Sandy Powell, for screenwriting and costume design (The Favourite). First Man's production designer Nathan Crowley and music super-producer Mark Ronson, who co-wrote Shallow for A Star Is Born, could also make the cut. Ah yes, the Corboulds! If Paul Corbould is nominated for his visual effects work on Jurassic World: Fallen Kingdom, it will mean that for seven years in a row a Corbould sibling has landed an Oscar nomination, underlining their status as one of the Oscars' most ubiquitous families. His brothers Chris and Neil have gone on to win Oscars in the past. Paul has been nominated twice but never won.